Located 35km from the capital town Gangtok at an altitude of 5576ft in the west Sikkim amidst the Barsey Rhododendron Sanctuary is the newest addition in the tourist destination of Sikkim, Rinchenpong also known as the Silent valley. 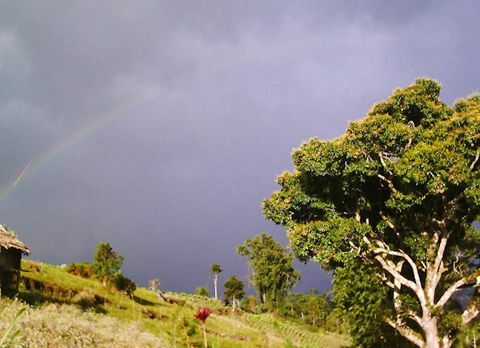 The Varsey Rhododendron Sanctuary or Barsey Rhododendron Sanctuary is situated in Western Sikkim in Singalila Range forming a natural border with Nepal in The West. 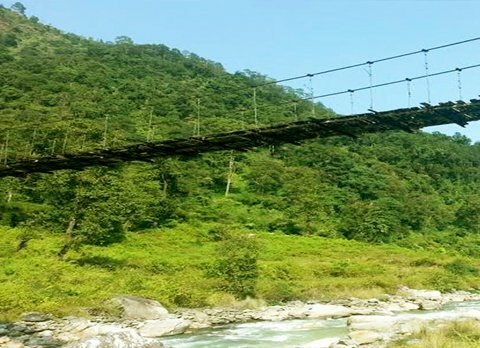 The sanctuary also borders the State West Bengal from Sikkim in the south by Rambong Khola stream. 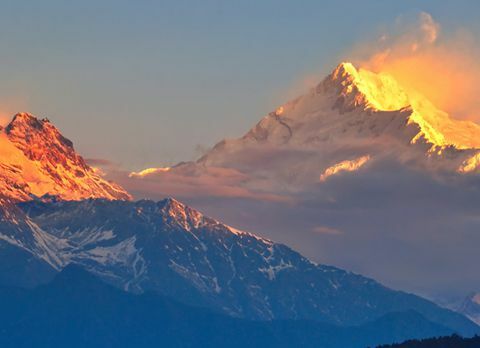 Rinchenpong with its astounding view of the majestic snow capped Himalayan Range and serene ambiance has become a favored tourist destination on travelers’ list within a short time. Endowed with lush green forest area Rinchenpong in the past was not known for its scenic beauty but for being a historical significant hamlet. Near the town is the site of a historical battle between the forces of the then Chogyal (King) of Sikkim and the invading British forces. And as per the story when the British sent expeditionary force to Sikkim in 1860, the Lepcha, native people of Sikkim used a concoction of unidentified herbs to poison the only water source. As a result more than half of the British forces were wiped out which stopped the British invasion and resulted in an accord. The lake remains poisoned even to this day and since that gruesome yet historical event it is known as bikh-pokhri where “bikh” word stands for “poison” and “pokhri” for “lake”. 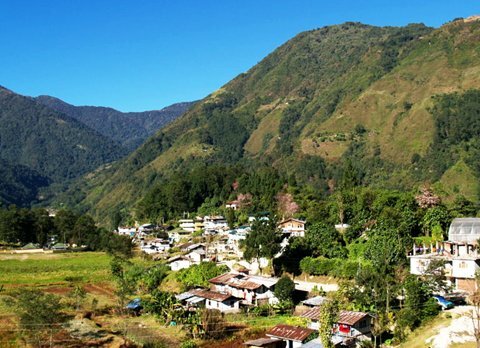 Nowadays along with the historical fact Rinchenpong is famous for the trekker trail which is sprawled around this serene hamlet. Those trekking trails lead visitors to some pictorial places built in historic era, Rinchenpong Monastery being one of them. 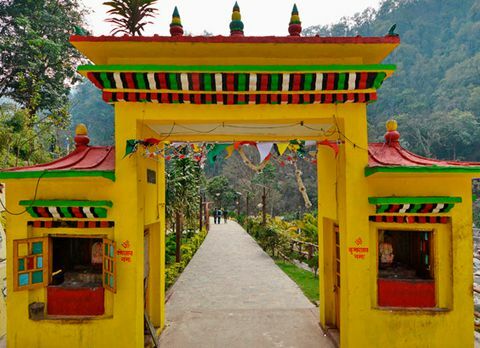 Built in 1730, Rinchenpong Monastery is the third oldest monastery of Sikkim. It is famous among the travelers for its unique idol of Ati Buddha in Yub-Yum position. A little further from this decades old monastery, is the charming Rishum Monastery an 18th century monastery sited at an elevation of 6250ft. 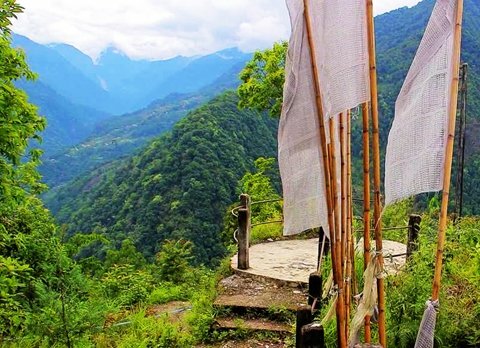 If the travelers are looking forward in learning new tradition they should continue with the trail after reaching Rishum monastery after walking through the lush green valley of Sikkim they will find the traditional Lepcha house, which was built in the old Lepcha style. To enjoy the mystical beauty of Rinchenpong and immerse oneself in the lingering essence of the historical era, visitors can halt in the 100 years old vintage British Bungalow which is only made with the help of woods and stone. Surrounded with the dense forest in the upper region of Rinchenpong, this age-old British Bungalow is the perfect place to stay and enjoy the freshness of Sikkim region. There are many picnic spots in and around Rinchenpong with some magnificent along with serene ambiance. 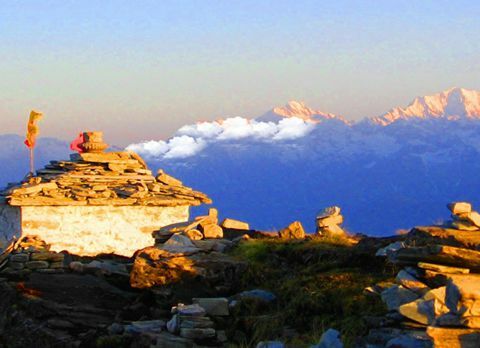 One of the trekking trails lead travelers to Maggi Dara which is famous among the visitors for the astounding sunrise above the snow capped mountains of the Himalayan Range. About 8 km from Rinchenpong, the Shrijanga Temple site is a common picnic spot for the locals. The Limbu tribe of Sikkim worship at this temple. A waterfall nearby adds to the beauty of the place. The forested area around Rinchenpong houses some of the rare Himalayan avi-fauna making Rinchenpong a popular birding destination for the avid bird watchers. 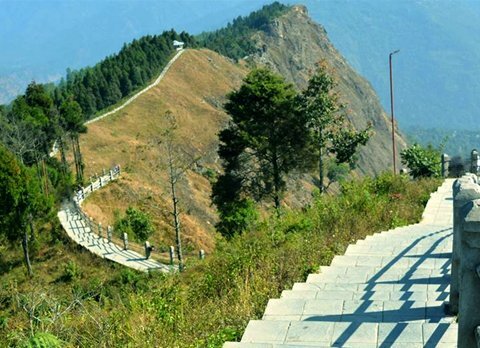 Overlooking the mighty Himalayas with many pictorial locations of historical significance and surreal natural beauty, the picturesque Rinchenpong has become a favored tourist destination of the western hamlet of Sikkim. From amazing forest trail to the breath taking sunrise over the Himalayan range, Rinchenpong has something to offer to its each visitor. 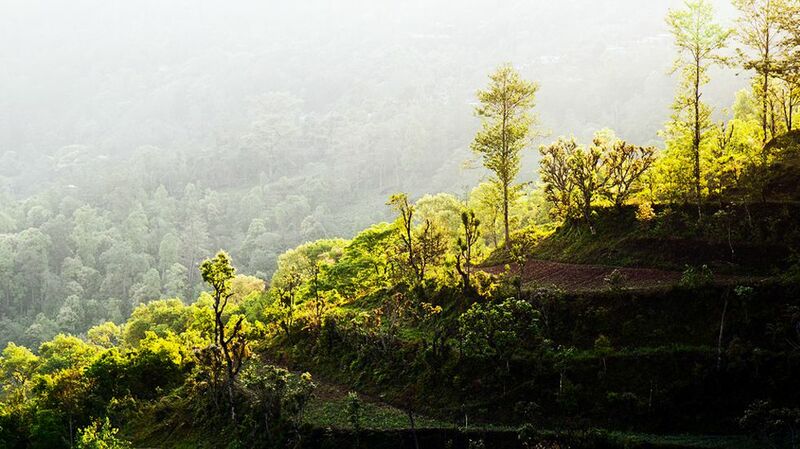 Away from the hustle bustle of cities, this quiet little hilly abode of Rinchenpong offers awe-inspiring views, unexplored spots and an enlightening dash of history. 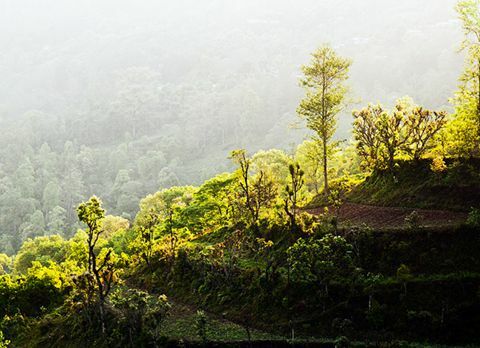 The beauty of Rinchenpong can be relished all through the year but spring from mid March to April and winter from mid September to mid December is considered as the best time to visit Rinchenpong. 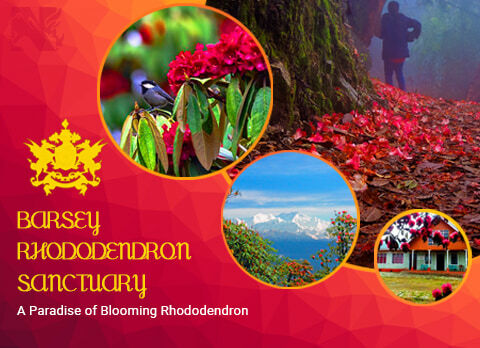 During spring the rhododendron of Varsey Rhododendron Sanctuary covers Rinchenpong in the beautiful shade of red and during winter tourist can enjoy the magnificent vista of snow capped Himalayan range.